A Florida gator was found cooling off in a swimming pool on Memorial Day. Seeking refuge from the blazing Florida sun, a scaly alligator found itself cooling off in a rather unusual place: A backyard swimming pool. 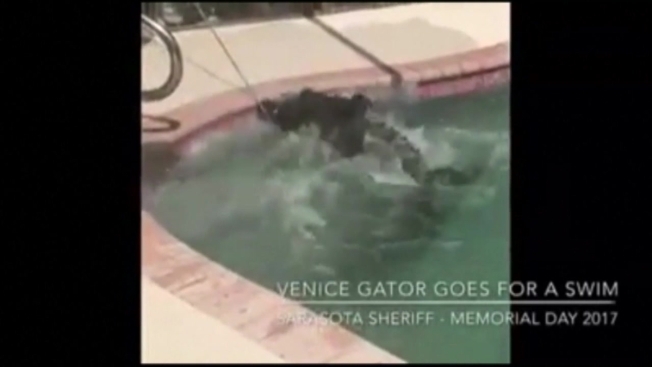 The swamp-dwelling reptile was spotted at the bottom of a residential swimming pool in Venice on Memorial Day, according to the Sarasota County Sheriff’s Office. Family members were about to jump in when they caught sight of the creature. Deputy Lori Clark responded to the initial call and notified the Florida Fish and Wildlife Conservation Commission, who sent over a trapper to relocate the gator. Video shows the alligator, measuring from six-to-eight feet, thrashing about in the water as the trapper captures and removes it. It is being sent to a "more appropriate" location, according to the sheriff's office.